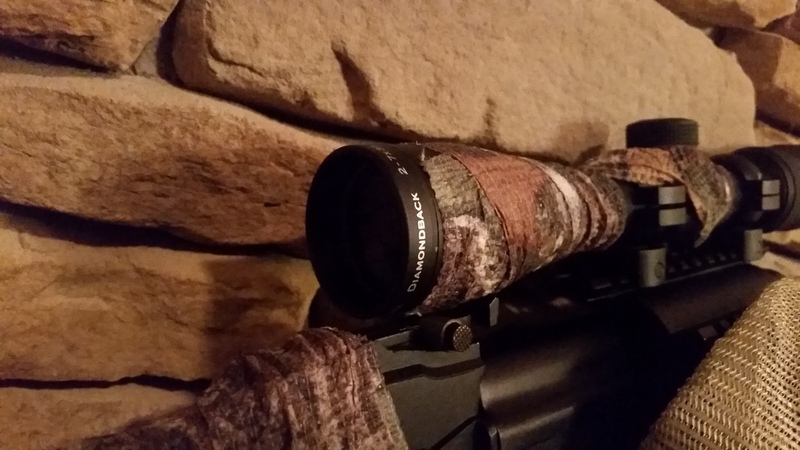 I recently picked up the Vortex Optics Diamondback 2-7×35 Deadhold BDC optic when I visited their location in Middleton, Wisconsin last week. Before I get to talking about the optic, I need to rave about the service I received at their location. HOLY CRAP, everyone there was super friendly, amazing helpful, and most of all, they were extremely knowledgeable! I can’t stay how refreshing it is to go visit a firearms related store and be able to talk optics, guns, and the firearms industry with some smart people. So kudos to their whole team and especially to Ken who helped me out, taught me quite a bit about optics, and talked with me for probably 30 minutes about random gun stuff. I purchased this optic specifically for my incoming (at the time) Ruger American Ranch Compact calibered in .300 blackout. I wanted a mid-level zoom on the optic as most likely all my shots would be within 300 yards. I initially wanted to get a Crossfire II in a 1-4 configuration, however, the Diamondback does have better glass. I was able to look at them both and compare, yes the Diamondback does have better glass and that is verified by a sales guy at Vortex. I went with the 2-7×35 which has a smaller eye relief to match the 12.5″ length of pull on the compact Ruger. The eye relief comes in at 3.9 inches on this 1″ tube optic and the total weight of it is 14.3 ounces. So far with this optic I have put approximately 30 rounds of .300 blackout through my Ruger with this optic and another 200 rounds with my 7.62 Saiga. My first 3 shots out of the ruger where a sub 1″ group. The optic was very easy to sight in and adjust with 1/4″ moa clicks and had no issues with recoil of either firearm. I went with the BDC model of this optic over the V-Plex as I am familiar with BDC optics from my last Nikon Prostaff BDC optic. 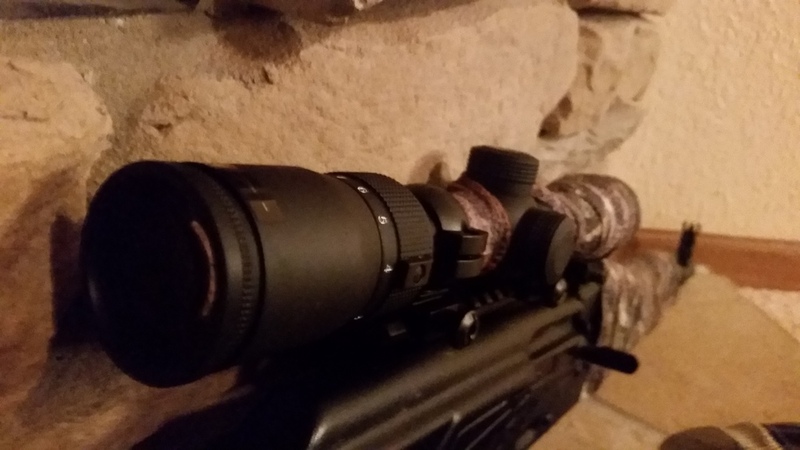 This past weekend, I had the opportunity to use the new optic in the wild while out deer hunting, mounted on to my 7.62 SaigaAK. Yes, it was not mounted on my .300 blackout and that debacle can be viewed here. The day started out pretty warm for a winter day at around 46 degrees and then progressively got worse with rain and then snow. Jesse from Forest City Tactical (amazing holster company), Adam from American Defense Manufacturing, and myself started out that morning on a family farm. Jesse and myself sat along a tree line hoping to catch deer moving along with. I was able to scan the nearby tree lines in first light situation with amazing clearness. I was pretty impressed with how the optic performed in rather low light conditions. As the day progressed and we marched tree lines, fought thick brush and walked all over the area (with no luck) the weather turned against us and started raining. With all the brush, undergrowth, and trees I went through with the gun, the exposed parts of the optic have no scratches or scrapes (some parts of the optic do have camo tape on them). I never ran into any issues with water in regards to the optic’s performance. On top of no issues from the rain, I also should mention no issues with the optic from going to cold temperatures (outside) to instantly warm temperatures (vehicle) and then back out into the cold. I never experienced any fogging issues with the lenses nor any condensation issues or other issues with water vapor inside the optic. It started to snow and the optic stayed true with no issues just like during the rain. This evening while behind my place of work, I had the opportunity to view three doe at about 250 yards in low light levels as the sun had already set. I was extremely shocked at the clarity and the light draw this optic had in very poor lighting conditions. I even looked through Sworovski Bionoculars at the same doe and the difference is noticeable in the low light, but for the price the performance of the Diamondback was amazing. I am thoroughly impressed with this optic, especially at MSRP of $179.00. In regards to any knocks on the optic, I don’t have any yet. I would like to see vortex offer a throw level for this optic (Diamondback HPs are only supported currently) as this might be a great entry level optic for people just getting into any sort of short range competition shooting. There might be some third party throw levers but I haven’t found any yet. Will post up a full video review soon!